11β-hydroxysteroid dehydrogenase type 1, or 'cortisone reductase' is an NADPH-dependent enzyme highly expressed in key metabolic tissues including liver, adipose tissue, and the central nervous system. In these tissues, HSD11B1 reduces cortisone to the active hormone cortisol that activates glucocorticoid receptors. The protein encoded by this gene is a microsomal enzyme that catalyzes the conversion of the stress hormone cortisol to the inactive metabolite cortisone. In addition, the encoded protein can catalyze the reverse reaction, the conversion of cortisone to cortisol. Too much cortisol can lead to central obesity, and a particular variation in this gene has been associated with obesity and insulin resistance in children. Two transcript variants encoding the same protein have been found for this gene. 11β-HSD2 is inhibited by carbenoxolone, a drug typically used in the treatment of peptic ulcers. Moreover, 18alpha-glycyrrhizic acid from the root of glycyrrhiza glabra was discovered as an inhibitor. Salicylate downregulates 11β-HSD1 expression in adipose tissue in obese mice and hence may explain why aspirin improves glycemic control in type 2 diabetes. Epigallocatechin gallate from green tea can also potently inhibit this enzyme, which might partly explain the anti-stress properties of green tea consumption. ↑ "Entrez Gene: HSD11B1 hydroxysteroid (11-beta) dehydrogenase 1". ↑ Classen-Houben D, Schuster D, Da Cunha T, Odermatt A, Wolber G, Jordis U, Kueenburg B (Feb 2009). "Selective inhibition of 11beta-hydroxysteroid dehydrogenase 1 by 18alpha-glycyrrhetinic acid but not 18beta-glycyrrhetinic acid". The Journal of Steroid Biochemistry and Molecular Biology. 113 (3–5): 248–52. doi:10.1016/j.jsbmb.2009.01.009. PMID 19429429. ↑ Nixon M, Wake DJ, Livingstone DE, Stimson RH, Esteves CL, Seckl JR, Chapman KE, Andrew R, Walker BR (Apr 2012). "Salicylate downregulates 11β-HSD1 expression in adipose tissue in obese mice and in humans, mediating insulin sensitization". Diabetes. 61 (4): 790–6. doi:10.2337/db11-0931. PMC 3314355 . PMID 22357964. ↑ Hintzpeter J, Stapelfeld C, Loerz C, Martin HJ, Maser E (3 January 2014). "Green tea and one of its constituents, Epigallocatechine-3-gallate, are potent inhibitors of human 11β-hydroxysteroid dehydrogenase type 1". PLoS ONE. 9 (1): e84468. Bibcode:2014PLoSO...984468H. doi:10.1371/journal.pone.0084468. PMC 3880318 . PMID 24404164. Human HSD11B1 genome location and HSD11B1 gene details page in the UCSC Genome Browser. White PC, Mune T, Agarwal AK (Feb 1997). "11 beta-Hydroxysteroid dehydrogenase and the syndrome of apparent mineralocorticoid excess". Endocrine Reviews. 18 (1): 135–56. doi:10.1210/er.18.1.135. PMID 9034789. Agarwal AK (Nov 2003). "Cortisol metabolism and visceral obesity: role of 11beta-hydroxysteroid dehydrogenase type I enzyme and reduced co-factor NADPH". Endocrine Research. 29 (4): 411–8. doi:10.1081/ERC-120026947. PMID 14682470. Tomlinson JW, Walker EA, Bujalska IJ, Draper N, Lavery GG, Cooper MS, Hewison M, Stewart PM (Oct 2004). "11beta-hydroxysteroid dehydrogenase type 1: a tissue-specific regulator of glucocorticoid response". Endocrine Reviews. 25 (5): 831–66. doi:10.1210/er.2003-0031. PMID 15466942. Wake DJ, Walker BR (Feb 2006). "Inhibition of 11beta-hydroxysteroid dehydrogenase type 1 in obesity". Endocrine. 29 (1): 101–8. doi:10.1385/ENDO:29:1:101. PMID 16622297. Tannin GM, Agarwal AK, Monder C, New MI, White PC (Sep 1991). 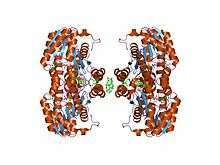 "The human gene for 11 beta-hydroxysteroid dehydrogenase. Structure, tissue distribution, and chromosomal localization". The Journal of Biological Chemistry. 266 (25): 16653–8. PMID 1885595. Graham DL, Oram JF (Jun 1987). "Identification and characterization of a high density lipoprotein-binding protein in cell membranes by ligand blotting". The Journal of Biological Chemistry. 262 (16): 7439–42. PMID 3034894. Whorwood CB, Mason JI, Ricketts ML, Howie AJ, Stewart PM (Apr 1995). "Detection of human 11 beta-hydroxysteroid dehydrogenase isoforms using reverse-transcriptase-polymerase chain reaction and localization of the type 2 isoform to renal collecting ducts". Molecular and Cellular Endocrinology. 110 (1–2): R7–12. doi:10.1016/0303-7207(95)03546-J. PMID 7545619. Mune T, Rogerson FM, Nikkilä H, Agarwal AK, White PC (Aug 1995). "Human hypertension caused by mutations in the kidney isozyme of 11 beta-hydroxysteroid dehydrogenase". Nature Genetics. 10 (4): 394–9. doi:10.1038/ng0895-394. PMID 7670488. Ricketts ML, Verhaeg JM, Bujalska I, Howie AJ, Rainey WE, Stewart PM (Apr 1998). "Immunohistochemical localization of type 1 11beta-hydroxysteroid dehydrogenase in human tissues". The Journal of Clinical Endocrinology and Metabolism. 83 (4): 1325–35. doi:10.1210/jc.83.4.1325. PMID 9543163. Calvo D, Gómez-Coronado D, Suárez Y, Lasunción MA, Vega MA (Apr 1998). "Human CD36 is a high affinity receptor for the native lipoproteins HDL, LDL, and VLDL". Journal of Lipid Research. 39 (4): 777–88. PMID 9555943. Odermatt A, Arnold P, Stauffer A, Frey BM, Frey FJ (Oct 1999). "The N-terminal anchor sequences of 11beta-hydroxysteroid dehydrogenases determine their orientation in the endoplasmic reticulum membrane". The Journal of Biological Chemistry. 274 (40): 28762–70. doi:10.1074/jbc.274.40.28762. PMID 10497248. Sriskanda V, Schwer B, Ho CK, Shuman S (Oct 1999). "Mutational analysis of Escherichia coli DNA ligase identifies amino acids required for nick-ligation in vitro and for in vivo complementation of the growth of yeast cells deleted for CDC9 and LIG4". Nucleic Acids Research. 27 (20): 3953–63. doi:10.1093/nar/27.20.3953. PMC 148661 . PMID 10497258. Schutte BC, Bjork BC, Coppage KB, Malik MI, Gregory SG, Scott DJ, Brentzell LM, Watanabe Y, Dixon MJ, Murray JC (Jan 2000). "A preliminary gene map for the Van der Woude syndrome critical region derived from 900 kb of genomic sequence at 1q32-q41". Genome Research. 10 (1): 81–94. doi:10.1101/gr.10.1.81 (inactive 2016-06-17). PMC 310500 . PMID 10645953.
Cooper MS, Walker EA, Bland R, Fraser WD, Hewison M, Stewart PM (Sep 2000). "Expression and functional consequences of 11beta-hydroxysteroid dehydrogenase activity in human bone". Bone. 27 (3): 375–81. doi:10.1016/S8756-3282(00)00344-6. PMID 10962348. Reddy ST, Wadleigh DJ, Grijalva V, Ng C, Hama S, Gangopadhyay A, Shih DM, Lusis AJ, Navab M, Fogelman AM (Apr 2001). "Human paraoxonase-3 is an HDL-associated enzyme with biological activity similar to paraoxonase-1 protein but is not regulated by oxidized lipids". Arteriosclerosis, Thrombosis, and Vascular Biology. 21 (4): 542–7. doi:10.1161/01.ATV.21.4.542. PMID 11304470. Pácha J, Lisá V, Miksík I (Feb 2002). "Effect of cellular differentiation on 11beta-hydroxysteroid dehydrogenase activity in the intestine". Steroids. 67 (2): 119–26. doi:10.1016/S0039-128X(01)00143-X. PMID 11755176. Albertin G, Tortorella C, Malendowicz LK, Aragona F, Neri G, Nussdorfer GG (May 2002). "Human adrenal cortex and aldosterone secreting adenomas express both 11beta-hydroxysteroid dehydrogenase type 1 and type 2 genes". International Journal of Molecular Medicine. 9 (5): 495–8. doi:10.3892/ijmm.9.5.495. PMID 11956655. Mazzocchi G, Malendowicz LK, Aragona F, Tortorella C, Gottardo L, Nussdorfer GG (Jul 2002). "11beta-Hydroxysteroid dehydrogenase types 1 and 2 are up- and downregulated in cortisol-secreting adrenal adenomas". Journal of Investigative Medicine : the Official Publication of the American Federation for Clinical Research. 50 (4): 288–92. doi:10.2310/6650.2002.33012. PMID 12109593.